What is this type of weed? So, I was pulling weeds from the garden today (with no gloves). I was on a roll and stopped myself. I came across a weed that looked poisonous (are there any that are poisonous?). I have attached two photos. Can you tell me what type of weed this is? (It's the one with yellow/orange spots on it's leaves). Re: What is this type of weed? I don't know what your weed is, but nothing I recognize as "poisonous." There are really only two things I know of that you have to worry about touching / pulling (there are a number more that would not be good for you to eat, but I assume you are not going to go around eating unknown weeds ). "leaves of three, let it be." The leaflets are always in groups of three. They often, but not always, have little projections from the two side leaflets, like thumbs on a mitten. Looks a lot like carrot or Queen Anne's lace when it is little, but then it shoots up to 6 feet tall. Anything else that pops up in your yard should not bother you to touch, unless you have allergies/ sensitivities that most people do not have. Merida72 - not sure exactly which weeds you're trying to show us here in your photo. The large broad-leaf one or the smaller serrated-leaf one? I'm not sure if i pulled anything like that earlier...hopefully not! I do think there was something similar to the poison ivy..but I can't remember. I will take a look...all the weeds I pulled is laying in the yard right now. GardeningCook wrote: Merida72 - not sure exactly which weeds you're trying to show us here in your photo. The large broad-leaf one or the smaller serrated-leaf one? The larger leaf is a flower I am trying to regrow. It's the smaller one with the orange/yellow dots. I think the orange/yellow dots are actually some kind of fungal disease this plant is suffering from. 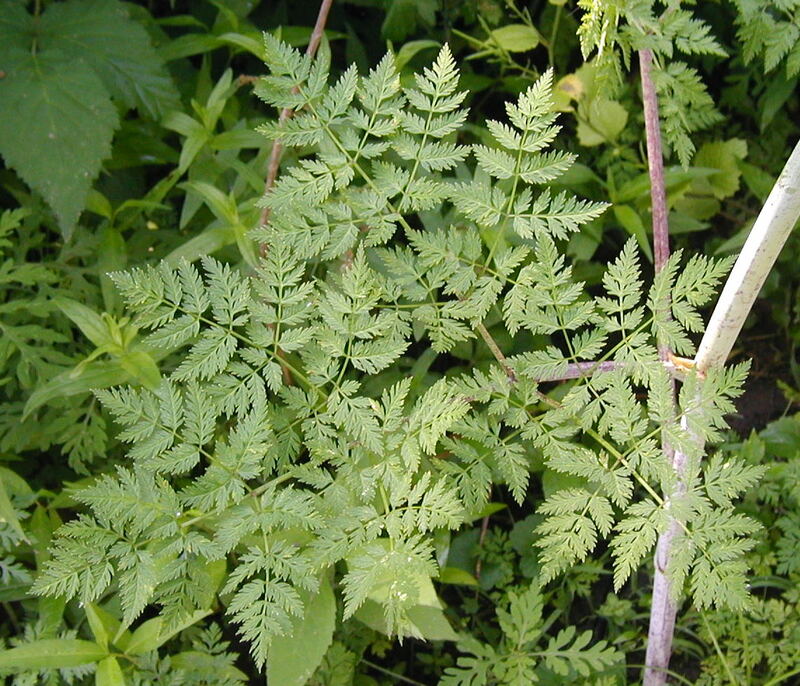 ...I don't recognize the plant itself although to me it looks like it could be in carrot/parsley/parsnip family. applestar wrote: I think the orange/yellow dots are actually some kind of fungal disease this plant is suffering from. Thank you. It could be that...just want to make sure it's harmless to me before I pull it. I don't own any garden gloves (need to get some). ACTUALLY, when I want to be absolutely sure of not getting ANYTHING on my skin while gardening, I use long nitrile kitchen gloves. Pull off inside out (And more importantly, outside in) and throw away. applestar wrote: ACTUALLY, when I want to be absolutely sure of not getting ANYTHING on my skin while gardening, I use long nitrile kitchen gloves. Great idea! I actually have some these. I will use them for the weed pulling. Thank you! 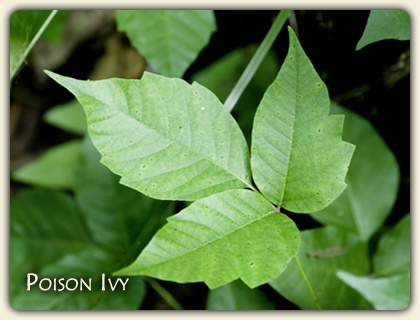 If you pulled poison ivy without wearing gloves, you'd already know it. applestar wrote: ....I use long nitrile kitchen gloves. Pull off inside out (And more importantly, outside in) and throw away. I learned the hard way that this is excellent advice. When I find a PI sprout, I use plastic bags as the glove. Put 3 up my arm (because 2 just doesn't seem like enough protection) and use bagged hand to pull sprout. Then use other hand to pull bag handles down over arm/hand, enclosing PI inside. Tie shut, put in dumpster, run to wash even though I know I didn't touch it. It's a very scientific process. IDK what your mystery plant is, but doesn't look like one I'd be afraid of. If it's possible for a plant to be irritating, I'm sensitive to all of them, even most of my house plants. Plenty of plants can cause a contact dermatitis, and many others can have irritating sap. If you notice sap inside a plant that has a color (like white or orange) or is sticky, be suspicious, wash hands, and avoid further unprotected contact. Finding out you have a sensitivity to latex, calcium oxalate, or other irritating alkaloids is a real, itchy bummer! Looks like some type of mallow to me.